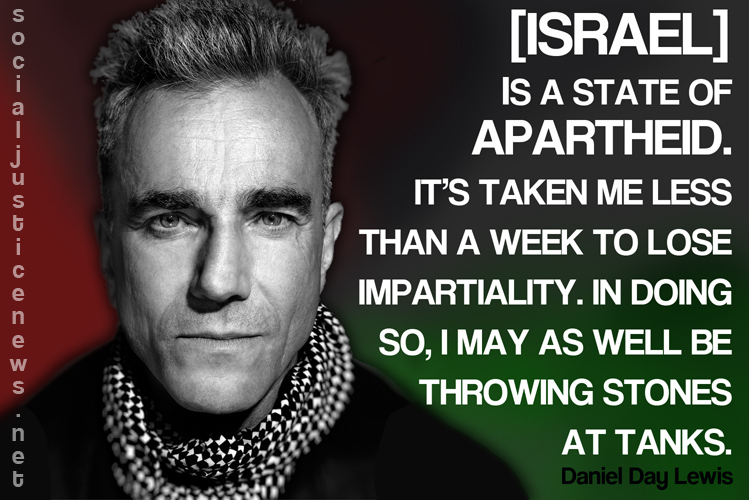 For years many people have been unaware of the situation between Israel and Palestine. Statements like “If only they would make peace with each other” were frequent and misinformation in the media meant it was difficult to know which version of the story was true or which side to support. In 2014 that changed. The stream of information from the news and social media about Apartheid Israel, the occupation of Palestine and the devastation of the open-air prison of Gaza with murders and maiming by the military might of Israel made it obvious that this wasn’t a fight between two equals. Over 1,500 Palestinian civilians were killed, including 551 children and 299 women. 6 Israeli civilians were killed. This means that over 99% of civilian deaths were Palestinians! One tragic event that demonstrates how the Israeli military indiscriminately slaughters civilians was the murder of four little boys playing football on a beach who were used for target practice. Despite the entire event being caught on film, on 11 June 2015 Israel exonerated the soldiers involved of all blame, describing the event as a ‘tragic accident’. No justice was done. The United Nations report released on 22 June 2015 called on Israel to “break with its lamentable track record” and hold wrongdoers responsible and laid most of the blame for the war crimes firmly at Israel’s political and military leadership’s door. In the year since the attack on Gaza, during a period of supposed ceasefire, there have been more deaths and more displacement as the false ceasefire is regularly, nay daily ignored and the Israelis kidnap and kill young and old Palestinians, demolish homes and steal land. On average every three days the Israelis murder a Palestinian child directly and many more are wounded or blinded, as Israeli snipers often use rubber tipped bullets, but are told to aim for children’s eyes in order to cause maximum damage. This attack on innocents is one of many unforgivable crimes. The statistics only describe those killed with rockets or bullets. They ignore the thousands of Palestinians who must have died through malnutrition or ill health through being forced to live without proper shelter, medical supplies, food or water. The facts about the atrocities last summer are well documented now, they are being presented with written and spoken testimonies, witness statements and forensic evidence to the ICC as a case is being made against apartheid Israel for its crimes against humanity. The bombing of innocent people trapped in a fortified open-air prison with phosphorus, Napalm and Flechette bombs, the sniping at Palestinians with dirty bullets is currently being exposed by the organization of Israeli ex-soldiers called Breaking the Silence. Every humanitarian the world over hopes this will lead to convictions for war crimes, though we know that there is no war here, only a terrible bloody occupation that persists even after the truth of the Zionist crimes are documented and discussed, even in the mainstream media. Earlier this year a Freedom Flotilla with approximately 70 activists, including the former Tunisian president, Moncef Marzouki attempted to break through the illegal blockade of Gaza to take desperately needed supplies to the 1.8 million Palestinian prisoners trapped there. The Israelis blocked the boats from entering, turning away food and medical aid. 5 years ago the Mavi Marmara, another peace flotilla destined for Palestine was boarded in an act of Piracy by the Israeli Military and 10 peace activists were murdered. The bravery of every flotillas’ crew is enormous and part of the purpose is to share the message with the world that this is not a situation where both sides are equal and just need to make friends. The Palestinians aren't even allowed food, concrete or medical supplies! You may feel that the Israeli occupation of Palestine has nothing to do with you, however this is not the case. More and more countries and organizations are recognizing Palestine as a country and more and more countries are recognizing Israel as a terrorist state. You can encourage the leaders of your country to take action to support Palestine and to boycott, sanction and divest from Israeli goods. If you are in America then you have the most power of all. The horrific slaughter and theft of land has only been allowed to continue because America has vetoed 42 of the 90 United Nations votes against Israel, preventing the world from acting to put a stop to Israel’s crimes (If you’re wondering, Palestine has had one United Nations vote against them, in the time during which Israel has accumulated 90). Israel has only remained powerful because America has supported them in doing so. This goes far beyond vetoing resolutions. America gives $8.5 million in military aid to Israel every day (Source - www.ifamericansknew.org/stat/usaid.html) and on 20 May 2015 the Obama administration gave $1.9 billion of arms to Israel, amounting to tens of thousands of bombs. 2 days later the American President Barack Obama said that Palestinians have a right "to be a free people on their land" and reiterated his support for two states living side by side "in peace and security." It is essential to judge our leaders not by their words, but by their actions and to seek out the truth, not accept the first view you hear. Today we have access to a wide range of video footage and photographic and documentary evidence of the injustices in the world, including the horrors that Israel are continuing to commit. We also have access to numerous different publications online, each with its own perspective. Organisations like Wikileaks also expose the lies our governments tell. The world is waking up and taking a long, hard look at the Israelis, at their apartheid colony and at their over involvement in American politics and the American economy. It’s time for you to wake up too and ask yourself what action you can take to end the Zionist tyranny and create the chance that Jews, Muslims, Christians and people of all religions or none will have the opportunity to become peaceful neighbors once again. For the latest information from Social Justice News on Palestine and Israel, including a first-hand account of visiting Palestine, please click the links on the right-hand side.